Till recently Gandhigiri was the purest form of protest. Now it is blackmail. Look at what Anna Hazare himself thinks about it being blackmail. Many people have accused him of blackmailing the government through his fast, we asked. “Yes, so?” he shot back. “As long as I’m alive and as long as it benefits the people, I’ll keep blackmailing the government. What’s the problem?” he chortled gleefully. I’d also like my readers to check out Vinod Sharma‘s excellent take on the protests. Refreshing to read about the protests and not getting caught up in a discussion on merits of the bill. The media – honorable exceptions apart – is being compelled to cover Anna; for the first time, it is following, not leading a campaign. Even more importantly, for the first time, people are not being influenced by the propaganda regularly unleashed by ‘experts’ and shallow, opinionated anchors who have held sway till now: the fast-growing web of social media is their new voice, one that will only grow louder. In fact so stung are some media stars by the almost brutal manner in which they have been sidelined, and their ‘Radia’ agenda lit up, that they have refused to cover this unfolding of history from Ground Zero right outside their doorstep. Acorn has a blog post up “FAQ: Why Anna is wrong and Lok Pal is a bad idea”. It is very well written and convincing in his usual style but ignores what I think is the core of the issue. The protests are neither intricately tied to nor are the protestors mobilized on the merits of the Jan Lokpal bill. This is my humble attempt to balance the debate. I stole the Q&A format from Acorn, who probably stole it from Karunanidhi. What is the significance of these protests ? This is the first time since independence that people are protesting without seeking anything for themselves. There have been thousands of protests over the years but they have always been about extracting some form of benefit from the state or regional protests for a narrower political space. Are you being clever by trying to delink these protests from the merits of the Jan Lokpal ? Look at it this way. The main point of the other side is that the misguided protestors have no idea about the hazards lurking in the Jan Lokpal; some op-eds even claim that 99% of the protestors haven’t read either the UPA’s version or the Hazare version. Tell me, if none of them have read or bothered to read the Jan Lokpal bill – how can the protests be about the Jan Lokpal bill ?. Discrediting the bill whether in a FAQ or in a press conference will have no effect on the protestors. Ask the trio of Mr Kapil Sibal, Mr P.Chidambaram, and Ms A. Soni, they tried. What are the protests about ? What is bringing people on the streets ? The protests are a generalized expression of rage against the corruption. The Jan Lokpal bill and the iconic figure of Anna Hazare provide the glue to bring people on to the streets. I would also say that this is not about retail corruption that you and I counter in day to day life. Most of us have become comfortably numb to that and I see no trigger for such an outpouring on that account. A casual visit to the protest sites in Chennai see a wave of anger against big ticket corruption like 2G and CWG. I see placards in all cities and Delhi that slam specific ministers involved in big loot. Why then are media outlets like CNN-IBN and intellectuals like Mr Nilekani harping on retail (everyday) corruption ? Because if the protests are about you not putting up with a personal inconvenience – then the protests lose their moral high ground. The media and intellectuals will go “Look selfish guy cant easily get passport or gas cylinder for himself so goes on street. “. The new “I am a shameless Indian I paid a bribe” campaign of the TV channel will fail. There are already new tricks which try to paint the protests with a casteist or religious brush (hailed by Acorn as “bandukwala rocks”). That too will fail. This is the first truly free agent protest we have seen. Analysts who bemoaned the inability of Indians to mobilize big crowds without political support are now suddenly shy. You wrote one of the first posts slamming the Jan Lokpal bill. You called it a lemon, now why are you playing a different tune ? I haven’t changed by views on the Jan Lokpal bill. I still think the bill suffers from the fatal flaw of selection. If the proposed Jan Lokpal setup works exactly as expected, we would be level. But if it doesn’t, we would be utterly devastated. The chances of it being level are about 10%. So in my view it isnt a risk worth taking. Is any kind of Lok Pal a good idea ? Yes, I think the a civilian investigative authority is a great idea. Designed properly, it can be made to work in such a way that even if compromised the downside is limited. I have blogged about it in this post “Report Generator Lokpal or Jail Sender Lokpal” in detail. A report generator Lok Pal with extensive investigative and subpoena powers can be very effective. Is this a magic pill ? No. Nothing in the world except a magic pill is a magic pill. I find such characterization annoying and lowering the level of debate. I think a good example is the recent report produced by Mr Santhosh Hegde. I have read the entire report and I congratulate him for that work. A Lok Pal would have allowed his team more teeth in the investigative process. Unlike Acorn, I dont think CBI/CVC can be strengthened independent of the political system being strengthened any more. Our train passed that station long ago. Reforms 2.0 should do the trick, correct ? Acorn says the 2G scam is due to the UPA balking at reforms ? No amount of reform could have stopped the 2G scam. This isnt an economic problem. The duly elected government displayed a wilful absence of good faith curating of a precious national resource. It is clear there were no studies undertaken to justify the pricing or the methodology, even if the purported benefits of increasing rural coverage were true. All institutions CVC/CBI/TRAI were managed. It is our enormous good fortune that the CAG happened to be free. An independent Lok Pal too can be managed with some effort but if its charter is to produce a report, the quality of its output will determine the extent of its damage. Here is an example : Lets say the CAG had been managed around the 2G scam timeframe. Its report would have produced arguments akin to what Sibal and Chidambaram are putting forth. The managed CAG report would tell us how this isnt a scam because no illegality took place and the winners issued new equity and did not sell the preferred stock. The public would have duly dumped the CAG too like it is dumping the duo of Kapil Sibal and P.Chidambaram. What about calling your representative instead of coercive street protests ? This theme is lifted straight from the United States. We dont have a culture of phoning our representatives. They take their commands from the party leadership. This works in cleanrooms when there are so many free agents in an area that individual phone calls can make your representative stand up and listen. I remember reading an angry voice in the comments section of a news site recently. Pushed on the unconstitutional means of protest – he retorted. “I am pissed about corruption and I want to go to the streets. You got a problem with that m**f***r ?” Can you argue with him ? About the hunger strike being blackmail. I dont think so at all. If the government cant handle this how is it going to handle a border crises ? 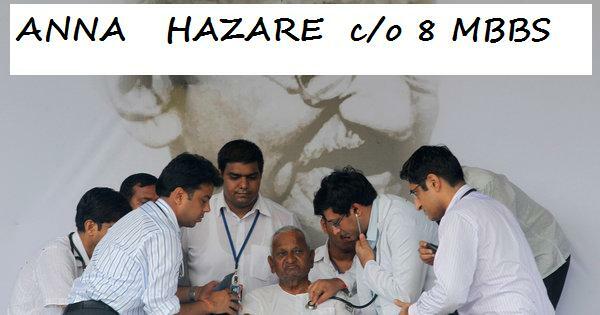 If push comes to shove – and Anna’s health parameters drop – step in and evacuate him to AIIMS. Also remember that our history syllabus has drilled into our heads how noble hunger strikes are. Culturally we are conditioned to accept this as a highest form of protest. Too late now. How about the middle class vote instead of these charades ? This is one of my pet themes and I have hundreds of posts on this blog on the subject of what I call “a free agent voter“. What Acorn and his ex? colleague Offstumped say will only work in a cleanroom. A mostly sterile state where all voters vote solely on big ticket items that affect everyone like corruption, price rise, terrorism, foreign policy and such. The problem is : It turns out it takes extreme hard work to get to that place. Things go downhill dramatically when the stakes include adhoc benefits that exist purely at the pleasure of a protector – namely the person on the ballot. You have to pay a price for defecting, voting against your tailored benefit. There is no such thing called the middle class in the electoral sense. It is merely a consumption category. Even if there was a middle class votebank there is no evidence to suggest they are the protestors. Even if all protestors are middle class, there is no evidence that they do not vote. This brings me to the conclusion of this FAQ. It came to this because a cornerstone for a constitutional democracy is being disrespected and the judiciary is doing little about it. This cornerstone is the right to equality. It has come to such a level that just uttering these words will brand you a casteist or a right wing fanatic. It goes without saying that in the Indian context, the right to social justice is also important. The trick is to balance equality and benefits based on a high bar of evidence and monitoring. This way the free agent voter population will continue to be high across all groups. Those really backward will be free to vote on corruption secure in the knowledge that their social justice is on autopilot and they are no longer beholden to their benefit protector. Freedom. Once a critical mass of free agents are in place (not necessarily middle class) – it is game over for blatant maladministration. A new India will arise and the climb up the positive spiral will be rapid. 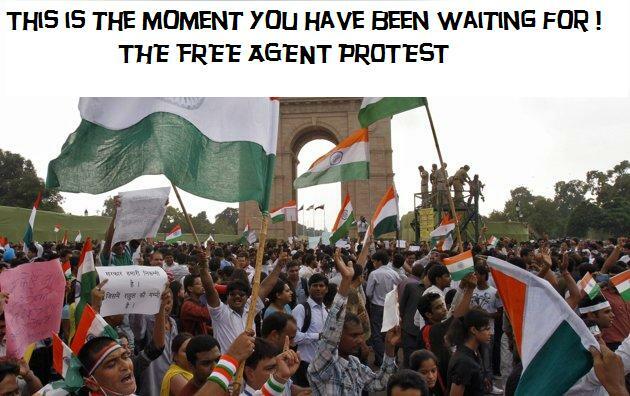 So people, Say “Hi” to the Era of Free Agent Protests where Indians protest as Indians. On things larger than themselves. I am in. Thanks for reading this post and props to all those who blog and read blogs. 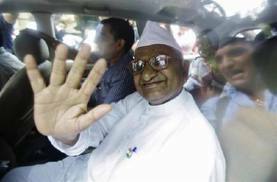 The media establishment were wondering on TV – Why Anna Hazare ? He is unelected, unconstitutional, can make any demands of the system, propose outlandish draft bills. He gets to draw tens of thousands of spontaneous supporters on the streets. He has the Delhi Police and the Home Ministry eating out of his hands. How did it come to this ? 1. The media prevented the opposition parties from taking any advantage from the individual corrupt acts of the ruling party. The BJP tried all it could including nixing an entire session of parliament. The AIADMK walloped the UPA partner DMK on the theme of corruption – yet no credence was given to it. Yeddy was brought in to check the BJP and give the CON as easy escape vent at every show. Now the Hegde report is out and it indicts civil servants and corporates – every single media channel has forgotten it. In fact, we have Sreenivasan Jain telling us how Adanis / Jindals are suffering due to suspension of mining. No love. 2. CON committed and continues to commit the big blunder of fielding legal smartasses like Abhishek Singhvi and Kapil Sibal. Their clever courtroom arguments pisses off a lot of people – legal talk may convince judges but only commonsense can convince people. For example : Sibal taunting “Have you read the IPC? Show me what section of IPC is applicable?” or Singhvi saying “What loss – there is no loss, the policy was to allot spectrum at this price and it was done.Even if there is criminal culpability there is no loss”. Yes sir, but this kind of sneaky clever stuff will only make people ask the question – “Then maybe policy is the scam”. Such jugglery, lack of remorse, or redressal (such as cancellation of 2G licenses and recovering national loss) have infuriated people. They have to channel the anger. The media has closed ranks and shut out the opposition party – to whom the anti corruption benefits should rightfully accrue. If the BJP, who surely cant be blamed for scams even when out of power, were to benefit – that would be the constitutional way. You’d let the two duke it out inside and outside the house and let the vote decide. At the moment, Anna Hazare is the approved outlet for people to vent their anger at the corrupt and the smartasses who insult the intelligence of those who are already enraged. PS: We are not talking about the Jan Lok Pal bill here. Half page ad seen in major papers on the occasion of Independence Day. 75+ Lakh scholarships awarded till date. Is there a scholarship platform for all Indians ? 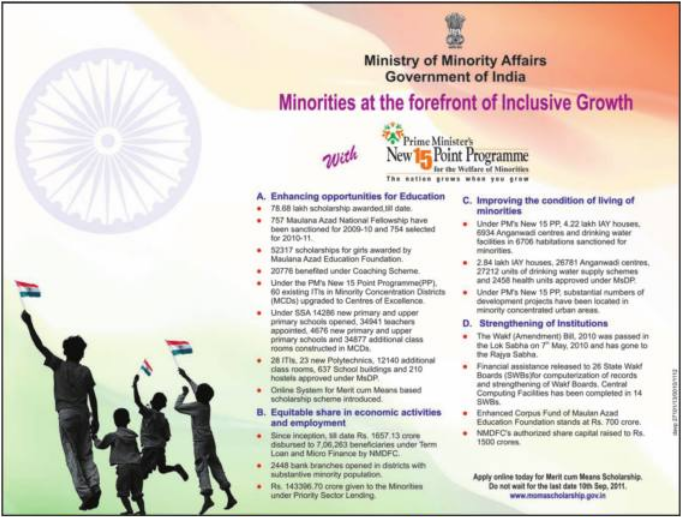 1.4 Lakh Crore given to Minorities under Priority Sector Lending. Are all poor not a priority sector ? 4.22 Lakh houses under IAY (Indira Awas Yojna) for minorities. Do all people in this slum get houses ? Jazzy website with online scholarship management (OSMS) . Are all Indians allowed to login ? Lakhs of beneficiaries at all levels including post matric (list here). Can all Indians get onto a similar list ? The simple truth is the UPA government is running a targeted benefit rollout as if there exists a much larger secular programme in place. Welcome to the twilight zone where inclusive turns into exclusive. From time to time, the plight of the manual scavengers are shown to us on Television or Print. One wonders whether the purpose is merely to shock viewers and demonstrate the intractability of the problem. This time CNN-IBN is telling us about the practice in Kolar, Karnataka. “No one is ready to give us work. I have four children, what do I do? I don’t have money to fix the roof in the rains. My children will also become manual scavengers,” Geetha said. Reality Check says : No, your children must be placed on the primary social justice platform. Here is something no one will talk about. Hopefully it will shock a couple of readers to a greater extent than the practice itself. What if I say the manual scavengers are just one of the victims of adhocim that passes off as social justice. 1. India has a primary social justice platform in the form of political, educational, and employment based quotas. 2. Nightsoil cleaners (manual scavengers) are the poster children for “socially aware” groups, NGOs, some bloggers. Their existence (as pathetic as it is) is almost always cited as the other side of the equality argument. One can ask there are hundreds of Brahmin poor but none of these poor are engaged in manual scavenging. What is the merit of one particular community in doing this work? 3. If they arent able to find a place on the social justice platform – in this case the Scheduled Castes quota – this is the severest possible indictment of the setup. The astonishing policy of not measuring the beneficiaries has absolutely crushed these people. 4. Even those who support them want them to be placed somewhere outside the primary platform. For example : They want training programs, loans, rehabilitation – anything but monitoring of beneficiaries on the primary platform. The next time some media house struts these programs, ask the question no one asks : Who is responsible for letting down this community for 60+ years ? Why was their progress and position on the social justice platform never measured ? How many other communities are there like this ? See my earlier post on the Arunthatiyars (Victims of data less social justice find a saviour). I personally know bands of people employed by various panchayats in TN specifically to handle trash. They live in tents on the periphery and NO their kids dont use RTE to go to school. They are the true lost children of this country. Social engineered out of the very system which uses them as its Raison d’être. Yet another spawn of the the scrutiny free quota regime has landed in New Delhi. The Supreme Court now has to pull another rabbit out of its hat to square it with its own earlier inscrutable judgments and long rope policy. The Kerala Govt under Mr Achutanandan in 2008 had announced a 10% quota to below poverty line “upper castes” . To be precise upper caste here means, castes currently not allowed to access a quota benefit. There was a hue and cry among the castes / communities availing of this adhoc benefit. The Muslim Jamath Council challenged the policy in the Kerala High Court. Here is the state general secretary of the Jammath. In this context, it is important to note all Muslims in Kerala are OBC. Addressing a press meet, Mr. Pookunjhnu said the government would be betraying the backward classes by implementing economic reservations criteria for higher education. It should change its stance on raising the concerns of only 18 per cent of the population who were crying for economic reservations against the majority backward classes for whom the Constitution had provided reservations for social justice, he said. The Kerala High Court rejected their arguments last year. “These communities must realise that government’s over indulgence in extending various benefits will only stunt their growth and time has come to awaken these communities from the slumber of satiated insouciance”, the court had said. Subsequently the Muslim Jamath Council and the Christian Service Society approached the Supreme Court. The matter was posted to a two judge bench of Jus Singhvi and Dattu which heard it today. Justice Dattu recused himself from the case as he was involved with its disposition as the Chief Justice of Kerala High Court in 2010. As of now, the case has bounced back to Chief Justice Kapadia who will post it to another bench. The Council, in its appeal, submitted that the State had no power to make reservation in the matter of admission to educational institutions solely on the basis of the economic condition of individual students. The Council argued that reservation was permissible only for the advancement of socially and educationally backward classes of citizens and for Scheduled Castes/Scheduled Tribes and any section of the forward community was ineligible and disqualified constitutionally from making any special provision. The responses of the bench was merely to question the locus standi of the complainants. Consider the tragedy of the situation. These communities who are included in the backward list avail of benefits even when their annual income is upto 4.5 Lakh. This is not considering the blanket creamy layer immunity to various groups. Yet, they cant stomach a 10% quota for poor forward community students who have to be below the poverty line to avail of the benefits. In other words, a Rs 4.5 Lakh per-annum group cant stomach his benefits extended to a Rs 11,000 per-annum group. But the Christian and Muslim groups have two important questions in front of the court. What is the rationale for a) including anyone and b) keeping them in the OBC list ? All Kerala Muslims and a number of Christians (except Syrian Christians) are in the OBC list. They have been there for decades and thousands of people have benefited to the detriment of thousands of others. The constitution amendment only allows for SEBC (Socially and educationally backward). They are on a strong wicket. The court has never laid down any guidelines nor imposed any scrutiny of classification. In fact, the court noted in 1996 that 80% of all open seats went to castes classified as OBC in TN. They papered over such an astonishing data point. They want the 10% quota for their communities too. The problem is all poor in their communities are already covered, it is just that the rich ones don’t let the benefits percolate. Pushing this point further only means that the creamy layer should be revised downwards to that the poor benefit. Clearly a 10% quota to BPL forward community will be greatly effective in terms of social justice the the existing OBC quota which is lopped off by a few at the higher end. The poor among these communities will then envy the safety net available to the forward communities and start questioning the entire system. The idea has been burnt into Indians that once a community gets an adhoc benefit – it is permanent – but only as long as their benefit protector is kept in good humour. The real test of the Supreme Court is whether it can scrutinize this adhoc runaway division of citizens. It started it in the Champakam Dorairajan case by giving the state a long rope with little data overhead. It failed in 2007. This failure will manifest itself in ways you cant imagine. The mysterious disappearance of all big ticket items from the voting booth. While we are busy analyzing scams, the government is busy with policies that strengthen identities and therefore puts a concrete price for defectors. See, the UPA Government is proposing to amend the Representation of Peoples Act 1951 – among the various items are debarring criminals and state funding for select people. But like anything else there must be specific adhoc benefits in everything. This news item was on the Times print edition but is missing from the online version. New Delhi: In a big move to keep criminals out of the political arena, the government is planning to amend the law to disqualify those who have been accused of heinous offences and against whom trial courts have framed charges. The proposal, assembled from the recommendations of former law minister Veerappa Moily, also has a provision to fund the election expenses of women candidates from the Scheduled Castes/Scheduled Tribes/OBC communities, whose annual income is less than Rs 5 lakh and family assets less than Rs 22 lakh. Source : Times of India Print Edition Aug 3 2011 Front Page. Now there is no rhyme or reason why a woman earning less then 5 Lakh and assets < 22 Lakh from the other communities cannot get the same benefits. This is yet another egregious example of unnecessary discrimination. Herein lies the secret of Indian democracy and why we fail to get out of third world status.